Tolerance Minister Sheikh Nahyan bin Mubarak greeted the crowd at the stadium before the pope's arrival for mass. Pope Francis held a historic public mass for an estimated 170,000 Catholics at an Abu Dhabi stadium on Tuesday on the first-ever papal visit to the Muslim Gulf. The United Arab Emirates (UAE) borders Saudi Arabia, the birthplace of Islam, but unlike its larger neighbour, which outlaws all non-Muslim places of worship, Abu Dhabi allows Christians among its large migrant workforce to practise their faith discreetly. Francis, who has made outreach to Muslim communities a cornerstone of his papacy, is wrapping up a historic three-day visit to the UAE on Tuesday. "How beautiful it is for brothers to be joined under this sky," said an MC in Arabic shortly after the pope's arrival around 10 am (0600 GMT). Inside the stadium, 50,000 Catholics with tickets to the mass cheered the pope on, with one small group hoisting a pink posterboard which read "We the Catholics of Yemen love you!". The UAE invited the pope to visit as part of its 2019 "Year of Tolerance"which has its own designated ministry. 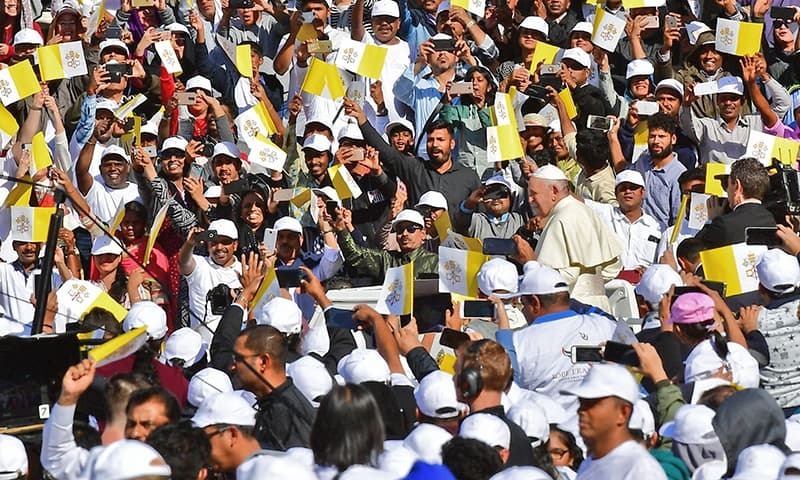 Pope Francis' trip has been warmly welcomed by Filipino and Indian Catholics among the UAE's huge migrant workforce. Asian nationals make up about 65 per cent of the population and are crucial to all sectors in the Gulf state, from construction to services and hotels. More than 85 per cent of the UAE population are expatriates, and about one million Catholics live in the country or about 10 per cent of the population. 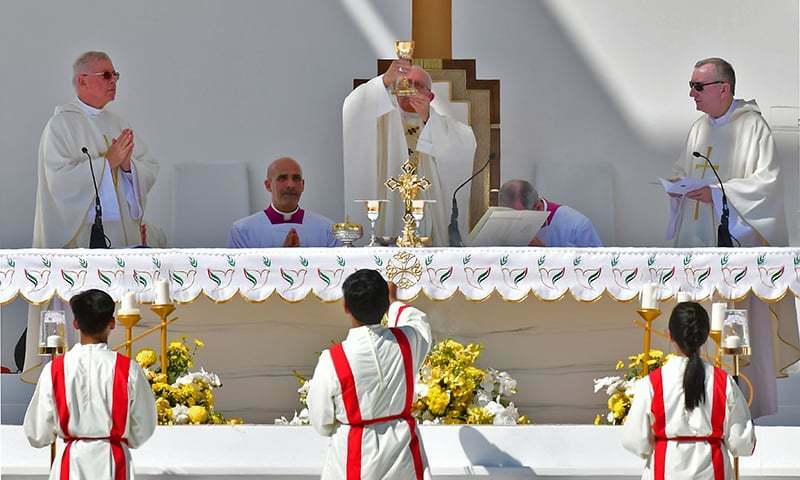 Tuesday's mass came a day after the pope called for an end to wars in the troubled Middle East, including in Yemen and Syria, at a meeting with a top sheikh and rabbi in the UAE. All religious leaders had a "duty to reject every nuance of approval from the word war", he told the interfaith meeting on Monday. "I am thinking in particular of Yemen, Syria, Iraq and Libya," he said. Yemen is in the grip of what the United Nations calls the world's worst humanitarian crisis, triggered by the intervention of Saudi Arabia, the UAE and their allies in a civil war between the government and Shia Muslim rebels. While the pope did not openly discuss politics, he called for "the full recognition" of the rights of people across the Middle East, a potential reference to communities including Shias in Saudi Arabia, refugees and migrants, stateless peoples and other minorities. He also held talks in Abu Dhabi on Monday with Sheikh Ahmed al-Tayeb — imam of Cairo's Al-Azhar, Sunni Islam's most prestigious seat of learning. It called for "freedom of belief", the "promotion of a culture of tolerance", the "protection of places of worship" and "full citizenship" rights for minorities.